SANTA CLARA, Calif. – Captain Russell Webb scored 18 points, freshman Sam Cusano scored three tries and loosehead prop Kevin Sullivan was named Man of the Match as California defeated Arkansas State, 43-13, to win the 2017 Penn Mutual Varsity Cup National Championship final Saturday at Stevens Stadium. The championship, the Golden Bears' second straight and 28th all-time in 15s, brings the program's total all-time national titles to 32 and head coach Jack Clark's all-time championship count to 28. The Varsity Cup national championship will air on television by tape delay at 7:30 p.m. PT/10:30 p.m. ET Saturday on NBC Sports Network. Coach Clark offered praise for the team and concern for the status of sophomore lock Robert Paylor, who was transported with an injury early in the first half. "I'm proud of our boys," he said. "They've shown significant improvement over the course of the campaign. Our excitement is tempered by Rob being in hospital. Our prayers are with him and his family." Take jump to read more. Cal (17-3) outscored the Red Wolves by six tries to two, with visits to the try zone by Sullivan, Aidan Flynn and Webb in addition to Cusano's hat trick. Webb also stroked 5-of-6 conversions and hit his only penalty attempt (1-of-1) from 38 meters in the second half. 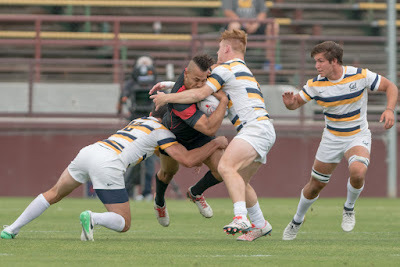 The Red Wolves (9-2-1) got onto the board with a first-half penalty kick by Valentine Balande that was followed by tries from Sione Fangauuiha and Dylan Boast in their first trip to a Varsity Cup final and second all-time national championship finals appearance. "We were able to run around the field and our physicality in the forwards allowed us to set up a lot of moves," said Sullivan, who scored his own try in the 35th minute to finish a five-phase sequence and set up several more with his passing. "We gave our backs a good platform and they did a great job. "Kevin worked so hard in the forwards and was leading play on the outside. He did it all today," said Cusano, whose contributions as a finisher all year were well represented by his three-try afternoon. "We're all happy to have done the work and applied the lessons. We stepped it up for the championship game." Webb, whose try came on a sly chip and chase that he followed with a difficult conversion in the 51st minute, said it was "getting back down to the basics" in the run-up to the championship that led to his 6-for-7 placekicking performance after a forgettable semifinal from the tee. "It was a comprehensive effort for sure, from the freshmen to the graduating seniors. We came together today and came through." The Bears now turn full focus to their end-of-semester exams as they transition their training back to Olympic 7s, which will take them to the Collegiate Rugby Championship June 3-4 in Philadelphia. There, the opportunity for another national championship awaits.